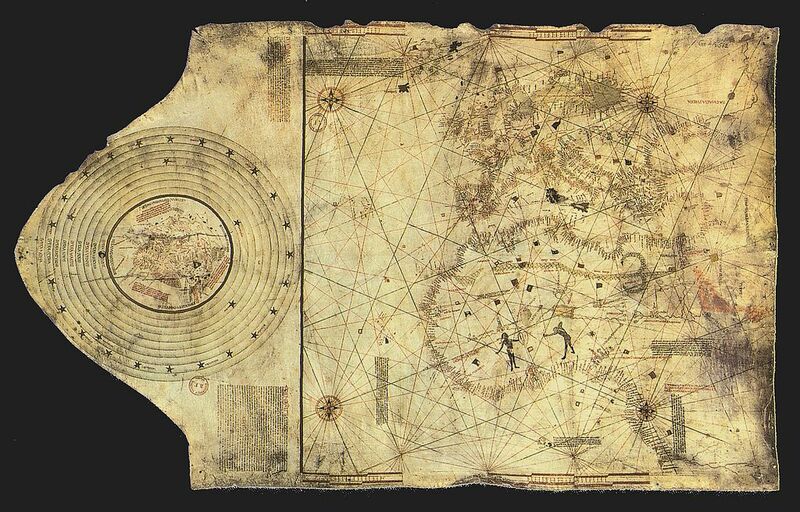 Map created in 1490 by Colón and his brother, as part of their plan to sail west across the Atlantic. As I make my way down the halls of the Museu da Marinha (Marine Museum), my eyes gaze in wonderment at the reconstructions of Portuguese sailing vessels, the authentic 17th century katana (samurai sword) brought back from Japan, and the old navigating devices that explorers used to traverse yet to be navigated seas. However, amidst all this, what always sticks with me are the maps. Throughout history, the Portuguese have always been quite secretive with their navigational maps, and to this day there are old maps in Portugal that you won’t find anywhere else, not even on the internet. In fact, this seems to be indicative of Portugal as a whole. There are amazing food products here (wine, olive oil, pork, etc), but it’s not as well-known internationally simply because the Portuguese like to keep a lot of it for themselves! Bookstores are full of Portuguese history books, on various topics that not even Google can help you with… believe me, I’ve tried tirelessly to search online for a lot of this info and it simply doesn’t exist outside of the country. This is why I’ve been coming to Portugal to study the culture, the food, and history… you have to have your boots on the ground if you’re going to learn about this historic country that is so much more than soccer and roasted chicken. How does all this connect to Christopher Columbus? I’ll tell you…. Let’s get something straight right off the bat. This post is meant to question, not to confirm. I have no smoking gun evidence of anything, and no matter what anyone claims, there is no such thing (yet), and may never be, for either side of the debate. However, since coming to Portugal, I’ve been somewhat obsessed with this story, and there definitely is a lot of damn convincing circumstantial evidence, along with a little common sense. As human beings, we’re naturally averse to questioning something we’ve long believed, but without questioning and further investigation, we’d never know half the things we know today. So, let’s start with what we’ve always been told. 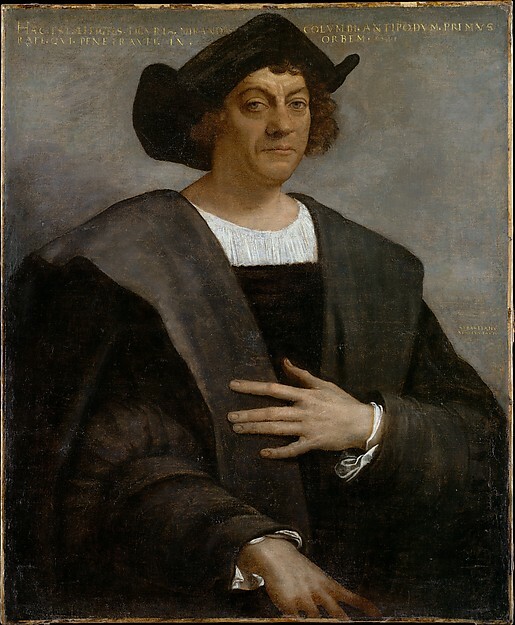 Traditional history (inaccurately) tells us that Christopher Columbus, the Italian explorer and son of a poor wool-weaver from Genoa, discovered America and the New World under the banner of Spain in 1492 when he sailed the ocean blue. Columbus Day is celebrated widely in the United States, especially among the Italian population, as he was the first person to both find America, and to prove that the Earth is round and sailors wouldn’t fall off the edge by sailing west from Europe. Tradition also tells us that as a navigator, he was pretty inept, and perhaps not the brightest of the bunch, but determination and luck led to his success. We’re told that his math was completely off and he only landed in the Americas by accident. Columbus claimed the new world for Spain, made them all extremely rich, and developed colonization in the Caribbean. We know all the facts of his voyages as well as his Genoese origin from his diary writing, as well as his Last Will. As much as I love history, here’s the problem with it. We often believe whatever we are told… even when it’s proven to be wrong, if the idea is there and we hear it long enough, we believe it. The traditional story of Columbus just has way too many holes in it. Historical researcher, Manuel Rosa is leading the way in the new theory of Columbus’ origins, but I’ll get into the new theory in a follow-up. Many others have also supported a new theory, as well as poked many holes in the old theory. There are definitely several things wrong with the traditional Columbus story that we’ve been told for centuries. 1. People in 1492 weren’t stupid enough to believe the world was flat, and we should give them more credit than that. For centuries before Columbus’ time, it was known that the Earth was a sphere, and no one was afraid of sailing off the edge of a gigantic waterfall into nothingness. In the 2nd century BCE, Eratosthenes, a Greek mathematician from Cyrene (now in Lybia) had already proved that the Earth was round, not flat, and even calculated the total circumference to a relatively accurate measure (only 66km different from what we now know as the actual circumference). I could go into he did this exactly, but it would take a while and it’s all based on pretty simple math, so just go with it. So yeah… people knew the Earth was round AND how big it was about 1600 years before Columbus sailed west. Afterall, if everyone really believed that the world ended just outside the Strait of Gibraltar, passed Portugal’s coast, then the Portuguese never would’ve found the Açores in 1427… 70 years before Columbus sailed. 2. Columbus did not discover America. Indigenous people were in the Americas for thousands of years. They were the first. Now that that’s settled, what about the first Europeans? When he first sighted land, it was in the Caribbean, believed to be what is now The Bahamas. Actually, he never even set foot in “America” or North America proper. He sailed around the Caribbean for his entire career, during his famous 4 voyages. To add to this, it’s long been proven that the Vikings had been to, and settled in Canada (Newfoundland) around 1000 AD. There’s also been more recent archeological discoveries of a possible additional Viking settlement in Canada. 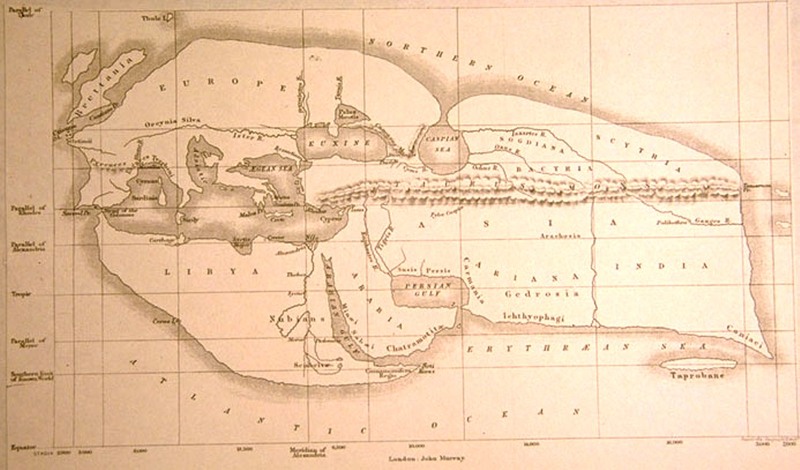 Many believe that they even sailed further south down the Eastern seaboard. So, we know for a fact that Europeans had been across the Atlantic for at least 500 years before Columbus. 3. Columbus couldn’t have been Italian OR Spanish, because neither of those countries existed. Ok, I know this is totally nitpicking, but this is something that always bugs me about labeling. In the 1400s, the area that is now Spain was actually a collection of separate kingdoms. Isabel of Castille and Fernando of Aragon got married, united their kingdoms (sort of), and then set out on a mission of conquest, to oust the Muslim Moors from southern Iberia and claim most of the region under a joint rule of two kingdoms (not one single “Spain” as many think), until the Hapsburgs took over under the Holy Roman Empire and unified all the kingdoms of Spanish Iberia under one kingdom in 1516. Similarly, Italy was not Italy until unification in 1861. Before that, the Italian peninsula was a conglomeration of sometimes cooperating, but often competing kingdoms and dukedoms. Therefore, under the traditional story, Columbus would be Genoese and not “Italian”. Yes, I get it, this is a lot of confusing semantics, but if you told people from Genoa or Venice at that time that they were all Italian and the same, they’d tell you to go F-off. As a matter of fact, it’s probably pretty much the same in Italy right now. They’re a very territorial bunch. On the same note, let’s remember that Portugal, with its current borders was already in existence for about 300 years by Columbus’ time. 4. Columbus is presented as a sort of Jesus-like figure with missing parts to his life story. The “Italian” explorer who gave Spain an empire and brought riches to Europe, while establishing a new holy land in the Americas. We are told where he was born, and then he seems to disappear for several years, until he mysteriously reappears already established and fully-skilled in Portugal as an adult. There’s also conflicting sources of where in Portugal he was. Some say he sailed around Europe, then shipwrecked in Portugal and settled in Lisbon before moving on to Spain (which was not Spain yet, *cough cough*). However, we know for sure that he was actually in Madeira, as there are records of him there, and the now ruins of a house where he lived (this will be connected to a future post, so remember this fact!) So, why do we only know the beginning and the end of Columbus’ life, but nothing in between? We’re supposed to believe that he just magically appears as a sailor and explorer, after coming from a poor wool-weaving family in another part of the world. On top of that, he is said to never have captained a ship before, but the Spanish monarchs are willing to give him all sorts of money and power to go on a crazy idea of exploration that no one else believed in? I sense something fishy here. 5. His name was not Christopher Columbus. We already know this isn’t true. This is a highly Anglicized version of the Latin/Italian Cristoforo Colombo. Now, as far as evidence goes, there is a record of a Cristoforo Colombo being born in Genoa at the time that is said that Columbus would’ve been born. The records however, have been found to be fraudulent, created after his death in order to claim his inheritance. Of course, some people still hold onto the fact that this record at one time existed (even though fraudulent) and the idea of him being born with that name in Genoa in 1451 has stuck. Some even agree that he may not the same person, but that the Genoese Colombo did exist, it was just someone else. Yeah… just a coincidence. You have me convinced. In fact, other than the fraudulent claim, there has never been any document found with the Latin version of the name. 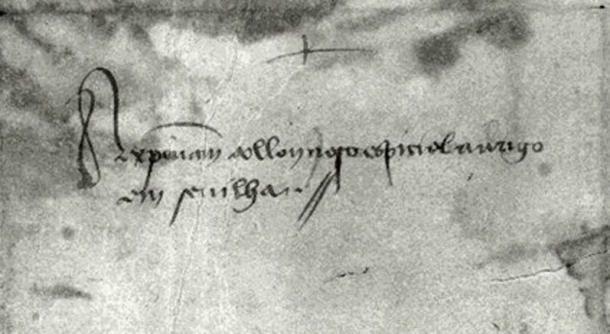 Most documents that exist, including papal bulls (written by the Pope, who was ITALIAN) have his name written down as Cristofõm Colón (actually written as “Xpofõm”)… which is Portuguese (Cristofõm was the predecessor for Cristovão). Not any Italian dialect, not Latin, not even Spanish… Portuguese. If he was from Genoa, sailing for Spain, why would he always be referred to in Portuguese? Although still debated, it’s now becoming more widely accepted among scholars and historians that Christopher Columbus was nothing more than a pseudonym used to hide his true name. The name is a very important and confusing part of the puzzle, so there will be more detail on this in a follow-up post. 6. Columbus never wrote in his “native language”. I put those words in quotations because what we’re working off the assumption of the traditional storyline. This tells us that Columbus was from Genoa, which would mean his native language would’ve been a Genoese dialect of Ligurian Italian. 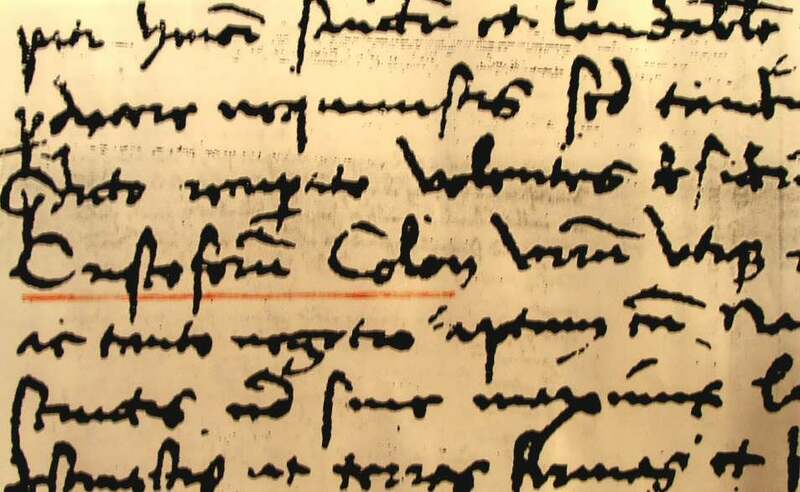 Out of all the documents that exist written by Columbus, not one single word is in Genoese Ligurian…. not one single word. There are however, documents with Columbus writing in Spanish and Portuguese. Interestingly enough, modern linguists who have studied the documents have said that he was masterfully fluent in Portuguese, equal to a native Portuguese speaker, but his Spanish was written as someone who would write Spanish as a second language, with his accent/influence being from a Portuguese speaker. Except from a Paps Bull, written in latin, but using Colón in the Portuguese spelling. 7. Columbus knew exactly where he was going. Or at least, he knew where he was not going. During the 15th century, exploring the oceans was the thing to do. The Islamic Ottomans had recently defeated the Byzantine empire and conquered Constantinople. With the constant back and forth holy wars between Islam and Christianity, they blocked off trade route access to the Europeans wanting goods from the east. This led to a massive increase in sea exploration to find another way around, and the Portuguese were the best sailors and navigators at the time. Getting into the navigational skills in fine detail right now, is too much and will be followed-up, but it’s safe to say that it would be ridiculous to think that Cristovão Colón (as I will refer to him from now on) had no clue where he was going, as is often implied in the traditional story. He was armed with many historical maps that we know of, and most likely some that we don’t know about, as the Portuguese were notorious for hiding and hoarding their navigational maps. It was actually outlawed to share their maps. Everything to do with navigation was a safely guarded state secret in Portugal, that was punishable by death. Having found Madeira and the Açores earlier in the 1400s, it’s clear that the Portuguese were already venturing far west of the European continent (the Açores sitting about 1600km west of Lisbon). It was also known that they were already fishing Canadian waters for their beloved bacalhau (cod) as well. There’s even some old Portuguese maps from before Colón’s time that depict areas thought to be parts of Canada, with the Portuguese crests marked on those spots… which is how the Portuguese marked areas of the world they had been or established some sort of colony or trading post. So, having been trained in Portugal and being armed with all the secret knowledge of Portuguese navigation… the maps, the skills, the centuries of past exploration… and the fact that they already knew the relatively accurate circumference of the Earth, do we really think that Colón was an idiot who chose to ignore centuries-proven math and exploration, and he had absolutely no clue where he was going? 8. Colón and King João II of Portugal were NOT mortal enemies. The traditional story tells us that Colón had first approached João II with his plan to sail west. Apparently, Florentine map-maker Paulo Toscanelli had approached the previous Portuguese king (Afonso V) with a plan to sail west to the Indies, claiming that the world was 1/3 smaller than Eratosthenes had calculated, but was rejected. It’s said that Colón then got hold of Toscanelli’s map along with his plan and continued the quest to make it happen, but was also rejected by Portugal. At the same time, there was an attempted coup in Portugal against João II, by some Portuguese nobles, aided by Queen Isabel of Castille. The attempt was stopped, and the leaders rounded up and executed. Many conspirators are said to have defected to Castille, Colón among them. Then, he spent some 8 years pitching his plan to Isabel of Castille, before she finally agreed to support his campaign… and the rest is history. This is how the story goes, anyway. Here’s the thing. There are too many discrepancies in that story. Too many to really list, but here’s some. First of all, we go back to Colón’s origins. This was a time and place where aristocracy and nobility are one world, and poor people are another. The original story never explains how it’s possible for a poor Genoese wool-weaver to all of a sudden appear in Portugal, learn all their well-protected navigational secrets among the best sailors in the world at the time, as well as weave his way into the nobility enough to take part in a secret coup attempt on the King. Oh yeah, he also married a Portuguese noble-woman too. Must’ve been a pretty smooth-talking wool-weaver. Second, there’s documented evidence that Colón and King João II kept in close contact, even throughout Colón’s time in Castille. A previously secret letter has been found that was written from João to Colón. The letter was addressed as, “Cristovão Colón, our special friend in Seville“. 9. The Picture of Colón is fake. Well, the actual painting itself isn’t fake, but it’s a made up representation of him. His picture is plastered all over the internet and school textbooks, and is the most famous image of the man who supposedly founded the New World… but again, we were all duped. You see, Colón never posed for a portrait. Ever. The famous painting of Colón that we all know and love was done by Sebastiano del Piombo in Rome, in 1519. There are two immediately glaring things wrong with this. First, Colón had never been to the Italian peninsula at all… at least as an adult. Second, he died in 1506. The image we all connect to Christopher Columbus. Piombo’s painting of Colón. Rome – 1519. He never even met the man. 10. 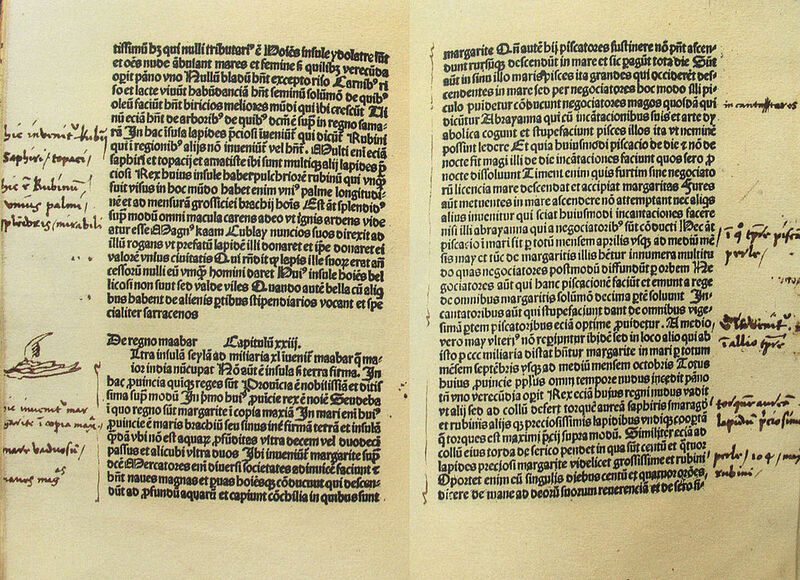 The Last Will of 1498 was a forgery. Colón died in 1506. Between 1578 and 1609, there was a lawsuit (yes, a 30 year lawsuit) battling for his inheritance. The Genoese Dukedom of Veragua had created a false will that claims Colón’s Genoese heritage and their link to him, entitling them to his inheritance. It’s since been proven that this “Last Will” was a fake, and even that further forgeries had been produced long after, into the 1800s… many believe even perpetuated by the City of Genoa itself, so not to lose their claim over his identity. The funny thing is, this is the document that is used to “prove” the explorer’s Genoese heritage. We know it’s a fake, and yet we still point to it as proof. Such is the human resistance to be open to anything beyond what we already believe to be true. No one likes to admit they are wrong, but come on… this one’s ridiculous. Ok, I’m gonna leave it there for now, since there is way too much to dig into on this subject for one post… it’s already long enough as it is! This initial posting was just meant as an introduction to the new theories that Colón was actually a Portuguese explorer, noble, and spy working on behalf of the Portuguese king to commit one of the greatest cases of deception ever, that worked so effectively that we all still believe this as our true history of the world. Everything I’ve written in this post, as well as things I will write in future posts are based on the research I’ve been doing while here in Portugal. It’s all based on findings by other researchers with way more skill than I have, I’m just compiling it for you to read, question, enjoy. On the next post about this, I’ll take you to the new theory of the story of Colón and the new evidence supporting it. Movie writers love to come up with plot twists that make us love them, but nothing in the fictional world can surpass what real history has given us…. sometimes you just have to open your mind and look a little further!